India once again produced an all-round clinical effort in the white-ball format that has been synonymous in the recent past with the men in blue. In their first outing, Virat Kohli’s men crush New Zealand before a bizarre and unprecedented sun-induced interruption overshadowed the on-field action on Wednesday. 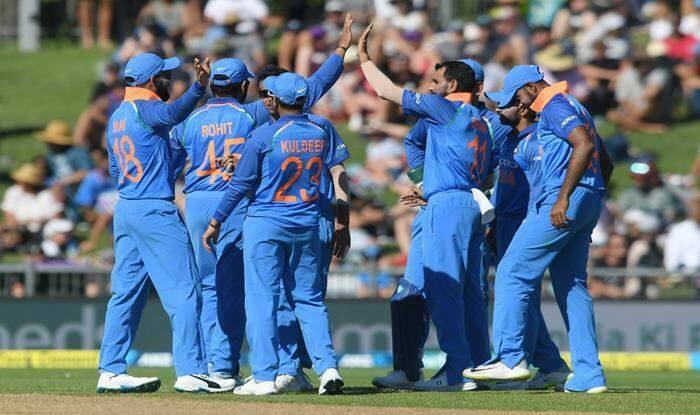 Entering the five-match rubber following maiden Test and ODI series triumphs in Australia, Team India signalled their intent with a clinical display, which saw them chase down a revised target of 156 by eights wickets in 34.5 overs. In response, Shikhar Dhawan began the innings with a flurry of boundaries, eventually finishing as the top-scorer with 75 off 103 balls. The left-handed opening batsman, battling indifferent form, studded his innings with six boundaries. India were comfortably placed at 44 for one when, in a bizarre turn of events, players walked off the ground after dinner because the setting sun made it difficult for them to spot the ball at McLean park. This led to an interruption that has never been seen in international cricket before. Because of the nearly half-an-hour delay, the target was revised to 156 in 49 overs, which the visitors chased without much ado. While Rohit Sharma may have lost his focus after the dinner break, Kohli and Dhawan didn’t let the sun-induced stoppage distract their minds when play resumed. Kohli, though, got out five short of a fifty. The Indian captain hit three boundaries in his 59-ball knock before pacer Lockie Ferguson had him caught behind with a quick delivery that caught the batsman by surprise. In the course of his 26th ODI fifty, Dhawan became the joint fourth fastest batsman to reach 5000 runs. Dhawan needed 118 innings to reach the mark. This knock will bring some relief for Dhawan as he hasn’t scored a half-century in his last nine innings. Earlier, opting to bat, the New Zealanders were off to an inauspicious start, losing both openers Martin Guptill and Colin Munro within the first five overs with just 18 runs on the board. By sending back Guptill in his 56th match, the 28-year-old Shami became the fastest Indian to reach 100 wickets in ODIs. Coming into the series after a hugely successful 2018, Ross Taylor looked good in his 41-ball 24, but he was brilliantly caught and bowled by Chahal, who lured the batsman to dance down the pitch a tad too early with his change of pace. Till Taylor was there alongside Williamson, things looked good for New Zealand, as the duo played a few delightful shots, especially the skipper whose trademark backfoot punch through the covers stood out. Tom Latham was dismissed in similar fashion, with leg-spinner Chahal being the bowler. Henry Nicholls and Mitchell Santner came, swung their willows for a six and a couple of boundaries, and got out to Jadhav and Shami respectively as New Zealand stuttered at 133 for six in the 30th over.